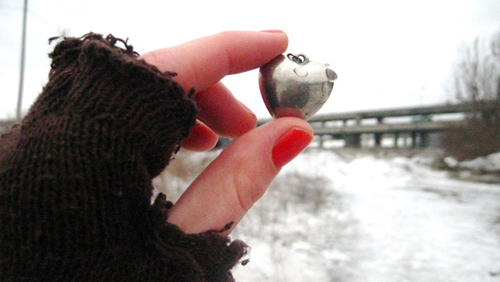 Seeing the Turcot Interchange with love and a found locket, Danielle Lewis, 2009. 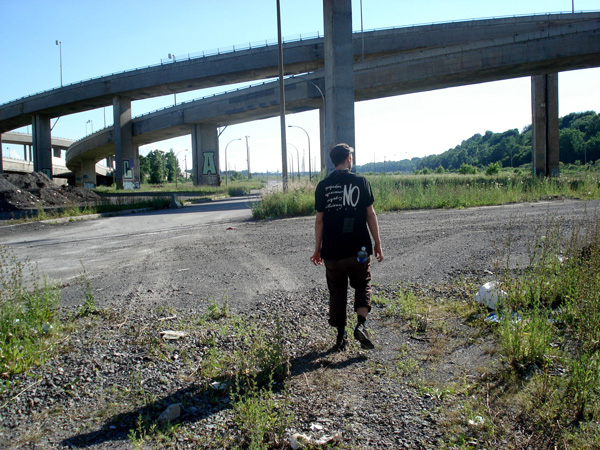 The Turcot Yards, located in southwest Montréal's Saint Henri neighbourhood and known lovingly by myself and many other residents as "the wasteland," is popularly understood to be one of the largest abandoned spaces in North America. 1 It is also a highly contested area that, far from empty and unused, has played an active role for a diversity of communities over time. 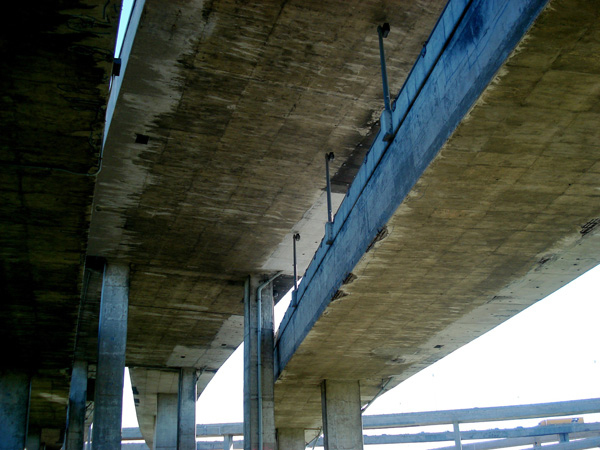 In light of the Quebec Ministry of Transport's ongoing plans to redevelop the Turcot Interchange, the point at which crumbling, concrete expressway systems overlap above the site, I want to express the importance of the existing interchange as a raised, monumental structure. Drawing from interviews with friends and neighbors concerning the site's uses and meanings, I propose to replace the framing of the yards as an "abandoned" site with an understanding of the ambivalent, queer "abandon" to the architectural object of the interchange and its place in a broader landscape. 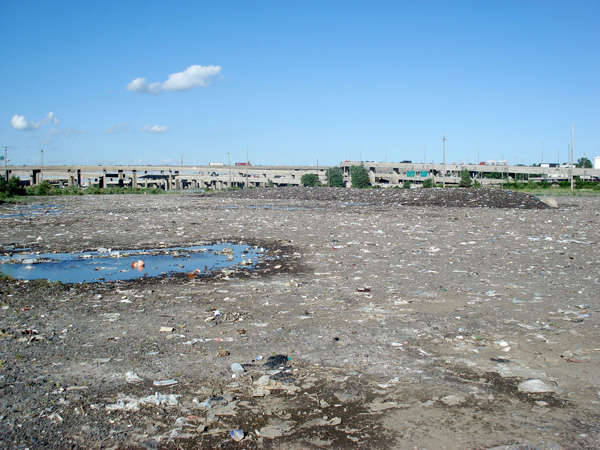 Views of the Turcot Interchange from the yards, 2008. The ambiguity of the Turcot Yards gestures towards the sublime, in particular a s a site that, from the ground level, seems impossible to grasp with an analytical distance, to accurately represent visually or verbally . One neighbour describes the area in an interview as both immensely beautiful and monstrous, emphasizing that no map of the yards could encompass the visceral experience of its territory. Looking out from under the interchange, one is confronted with an unusually vast area of open space, lined in the distance by long, unmarked buildings. In the winter, snow collected from other parts of the city is heaped into tall, artificial mountains and, as these slowly melt, lost or discarded objects from the city's streets and sidewalks are released, leaving clues to an unsolvable mystery. Small lakes are lined at their shores by scraps of paper, rusty parts of tools, snatches of fur lining, and single gloves. In the warmer months, these odd assortments are found amongst the area's natural growth, including unruly grass, bright goldenrod, and medicinal herbs such as mullein and echinacea. Towards its edges, the space is beset with unexpected hills, broken down piles of rock, confusing signage and the occasional fox, and is bordered by the dense forest of the Saint Jacques cliff. It is from this complex setting that the monumental interchange emerges , overarching the landscape. 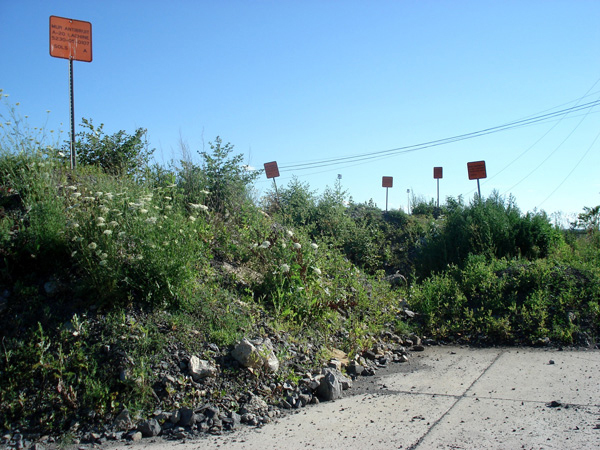 The Turcot yards after the snow melts and the ambiguous signage on unexpected hills, 2008. 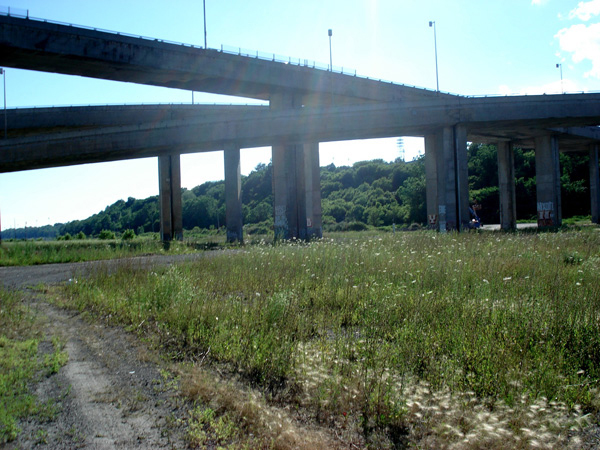 There is a disruption of one's physical and sensual stability in the Turcot Yards , a product of the collage-like formlessness and chaotic nature of the spaces literally leftover from major planning projects. 6 As one Saint Henri resident articulates, the interchange creates an affect within the yards that is both terrifying and oddly "comforting and homey." She focuses on an experience of sitting inside one of the windows that are set into the concrete train tunnel beneath the interchange. 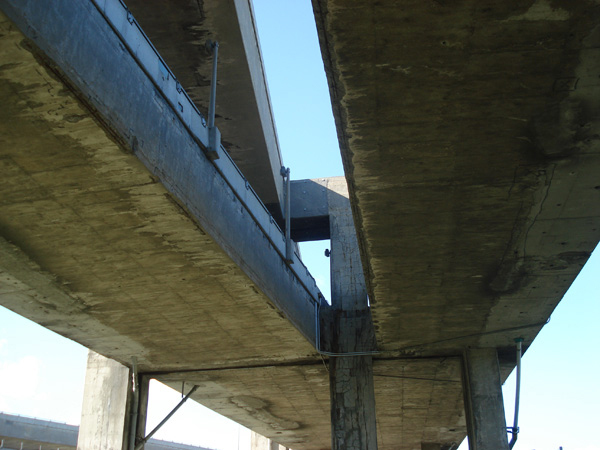 From this position, she felt threatened by the territory on either side of the window—the oncoming trains, the massive columns of the interchange, and the possibility of police lurking in unseen areas—but she also felt as if she were a part of the structure itself, as if they had somehow merged. This experience of suspended subjecthood recalls Barbara Freeman's feminist re-reading of the sublime, which proposes the possibility that the subject can experience an intensified merger with both architectural object and the surrounding landscape. 7 While the Kantian schema of the sublime demands that the chaos of materiality is quickly mastered by a subject's rationality, alternative models propose a sublime experience in which the subject no longer needs to dominate the landscape. 8 Rebecca Duclos posits a feminist sublime that moves from a momentary confluence of self and space to a calculated inattention to object as landscape. 9 This type of sublime encounter entails a particular type of abandon , a deliberate disregard for the object at hand. The sublime elements of the Turcot Yards provide a space of both convergence and difference, a place that is crucial for the maintenance of queer communality. Insisting that queerness is not just constituted in the body of the queer (in one's inhabitation, gaze or signage) but is a lived spatial process, Christopher Reed proposes that queer space be understood through the term imminent , meaning to loom over or threaten, "ready to take place." 12 He writes that " queer space is space in the process of, literally, taking place, of claiming territory." 13 As feminist critiques of the sublime move away from the need to master the landscape, the idea of queer space as imminent similarly opens up the possibility that the process or threat of spatial production can take precedence over the desire to claim or own space. Imminence, in this sense, could imply a balancing of the two sides of the sublime experience, convergence and difference. Convergence and difference in the yards, 2008. Duclos, Rebecca. "The Topology of Objecthood and Contemporary Art." Doctoral dissertation, University of Manchester, 2008. Podmore, Julie. "Lesbians in the Crowd: gender, sexuality and visibility along Montréal 's Boul. St-Laurent." Gender, Place and Culture 8:4 (2001): 333-355. Reed, Christopher. "Imminent Domain: Queer Space in the Built Environment." Art Journal 55:4 (Winter 1996): 64-70. Wilson, Elizabeth. “Against Utopia: The Romance of Indeterminate Spaces." In Embodied Utopias: Gender, Social Change and the Modern Metropolis , edited by Amy Bingaman et al., 256-262. New York: Routledge, 2002. 1 The landscape of the train yards changed drastically between 1961 and 19 67, when the CN closed down the roundhouse and a majority of the tracks for the construction of the Turcot Interchange, which was unveiled by the MTQ two days before Expo 67. MTQ purchased the yards from CN in 2003. 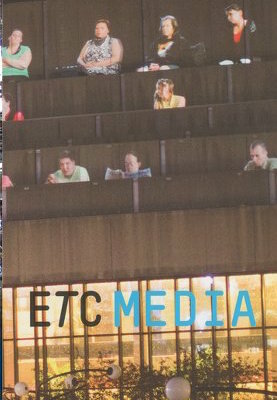 2 Elizabeth Wilson, “Against Utopia: The Romance of Indeterminate Spaces," in Embodied Utopias: Gender, Social Change and the Modern Metropolis , edited by Amy Bingaman et al. (New York: Routledge, 2002), 257. 3 While the majority of Saint Henri residents that I interview identify to some degree as queer, this is not necessarily the primary signifier of identity for individuals or the community at large, which is anti-capitalist and also consistently evades essentialization in its multiplicity. As the Mary Nardini Gang writes in the self-published 'zine towards the queerest insurrection , "queer is not a stable area to inhabit. 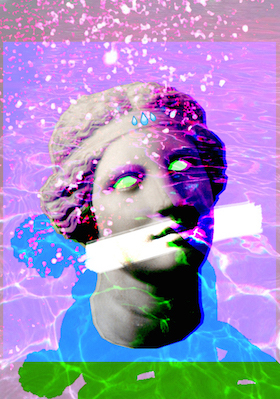 Queer is not merely another identity that can be tacked onto a list of neat social categories, nor the quantitative sum of our identities...Queer is a territory of tension, defined against the dominant narrative of white-hetero-monogamous-patriarchy, but also by an affinity with all who are marginalized, otherized and oppressed." 4 Julie Podmore, "Lesbians in the Crowd: gender, sexuality and visibility along Montreal's Boul. St-Laurent," in Gender, Place and Culture 8:4 (2001), 339. 6 Rebecca Duclos, "The Topology of Objecthood and Contemporary Art" (PhD diss., University of Manchester, 2008) , 69. 12 Christopher Reed, "Imminent Domain: Queer Space in the Built Environment," in Art Journal 55:4 (Winter 1996), 64. 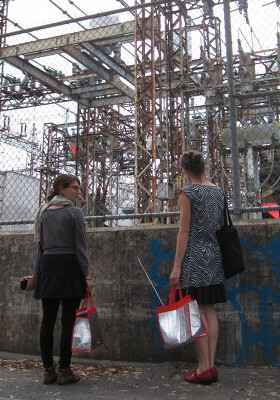 Danielle Lewis focuses on the intertwining processes of art, space and the everyday. She has written and given lectures on feminist and queer spatial issues, the politics and poetics of "home" and squatting, the history of utopian design and planning, community urban activism and aesthetics. Her MA thesis, Becoming Monuments and Embodying Utopias, explores the ways in which inflatable architecture can provide prototypes and platforms for resistant and alternative creativity in the everyday life of the city. 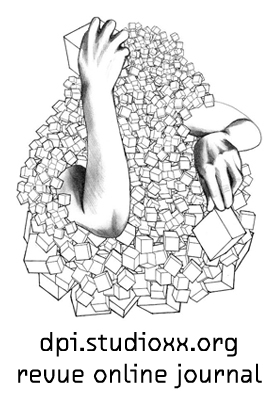 Danielle also maintains an artistic, organizing and collective practice that ranges through video and performance, 'zine production and distribution, collaborative design and construction.